Sunday’s 200k started on a sadder note. The San Francisco Randonneurs RBA, Rob Hawks, had informed us during the pre-ride meeting that a fellow randonneur and avid long distance cyclist, Tom Milton, had passed away of a heart attack during Saturday’s Devil Mountain Double Century. I had not met Tom personally, but I could tell that he was admired by many and incredibly accomplished. Tom was the founder of Selle An-Atomica and is credited for stirring up the waters of leather bicycle saddles influencing Brooks to bring back their Imperial model after retiring it for many years. In 2009, Tom Milton was inducted into the California Triple Crown Hall of Fame for completing 50 Double Centuries in the California Triple Crown Series. Rob spoke of a conversation he had with Tom and how they shared the excitement of all the new riders coming out for the 2010 brevets. Being a new rider with the San Francisco Randonneurs, I am incredibly excited and privileged to have found such a dedicated group of cyclists. So far in 2010, this has been my fourth brevet ridden. The conditions were ideal. Leaving the rain gear at home and bringing nothing but arm and leg warmers was a sigh of relief. This is usually the time of year when I start ramping up the mileage on weekend rides in preparation for something long, but thanks to the SFR schedule I can say that I am feeling really fit and have gained a lot of confidence in my riding abilities. I have learned a lot so far this year. I’ve ridden roads that prior to this year I had only been on in my car; I’ve learned about the importance of a big breakfast; and I’ve met some really great people who love bicycles. Thank you to those who ride and those who continue to inspire us to ride. 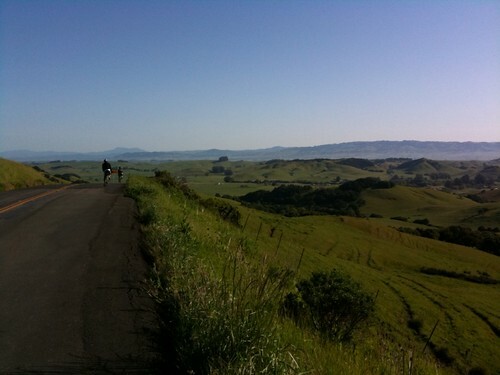 More photos from this ride can be found on my Flickr page.